The watermelon patch was always busy in late summer. 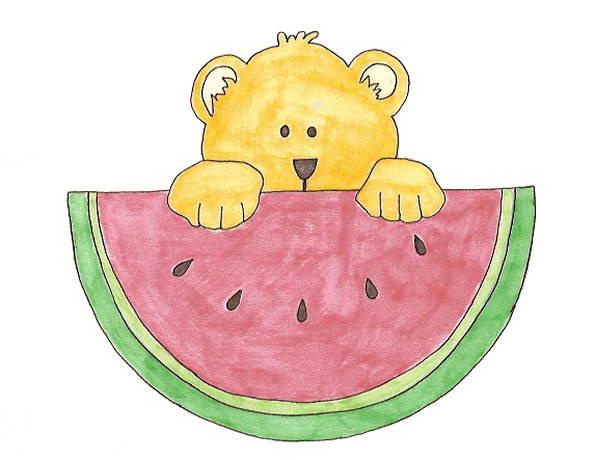 As the fruits grew larger, more and more animals visited it in hopes of finding the perfect watermelon. It didn't matter how big it was, or how hollow it sounded. The only thing that mattered was how sweet it smelled and how juicy it tasted. A bear cub happened to be exploring his new surroundings and saw all the animals at the watermelon patch. He listened to them talk and ran home to ask his mama about it. She told him that in a few days she'd take him there and he could pick out one just for himself. Noggy was excited. He'd never tasted watermelon before. The day arrived and Noggy and his mama headed for the patch. A lot of other animals were there with their mamas and papas, looking for the perfect watermelon. The gopher family picked out a large green melon with light green stripes. It was so big that it took all of them to carry it. Noggy watched as they bit into it. Red juice ran out. The baby gophers quickly lapped it up as mama gopher dug further into the melon. She popped her head out and was covered with red flesh. The gophers giggled and then climbed inside with her. They devoured the melon in minutes. “And the juiciest,” Noggy added. With a bulging tummy, Noggy curled up against his mama and fell asleep, dreaming of the juiciest watermelon in the patch.